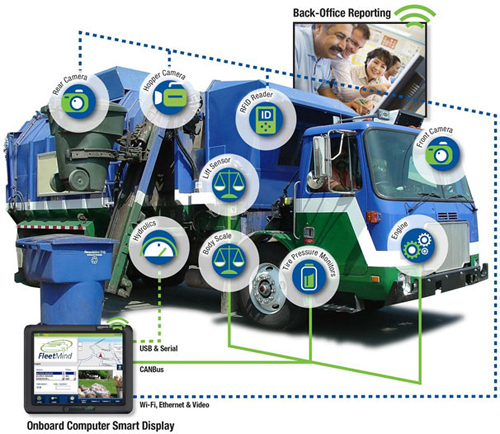 FleetMind Solutions is the award-winning technology leader for connected “smart truck” solutions for waste management fleets. FleetMind develops the industry’s most advanced ﬂeet management solutions specifically for waste and recycling environments. FleetMind systems are installed in thousands of vehicles across North America linking waste ﬂeet operations to their drivers and vehicles in real-time to ensure optimal productivity, safety, sustainability, proﬁtability and customer service. FleetMind provides industry-specific FleetLink mobile hardware solutions to automate the data recording of operations, including: vehicle information from GPS, ECM electronic control module; and service information from drivers, cameras, scales, and RFID. Operating on the Windows environment, all hardware is integrated with FleetLink back-office software. FleetLink Mobile products include in-cab flat/smart screen and DVR devices that are field-tested to withstand the toughest waste collection environments. A 3-Year supplier warranty, with extended options, is standard for all FleetMind mobile products.